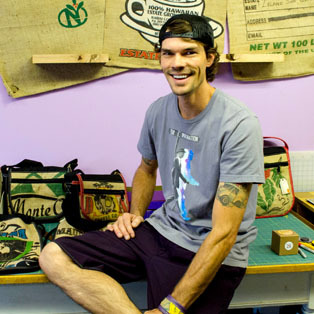 Chad Wagner turned his passion for the world-wide coffee bean business into upcycled fashionable bags. Working in every aspect of the coffee business for the past ten years, Chad has seen burlap bags from nearly every part of the globe. His latest coffee-themed business has emerged from collecting what he saw as “pieces of tossed art.” On a daily basis, local roasters receive raw beans from various countries. The beans come packaged in large burlap sacks, marked by colorful prints and the countries of origin. Because roasters don’t have an immediate use for large quantities of used up bags, they generally get discarded as trash. really limited run.” As a coffee bean salesman, Chad really wanted something to scream that he was in the business. He eventually met a local bag producer who agreed to collaborate on the first prototypes. With no prior experience in sewing, Chad learned to sew and produce his own bags within a span of six months. In 2013, P.U.N.A. (People Under New Aesthetics) was founded. P.U.N.A. embodies Chad’s passion for coffee through a fashionably functional outlet. Many of the designs encompass the cultivation of coffee. The stylish and functional bags include messenger, sidekick and quickpack models as well as a wallet. “I get inspired by the authentic art displaying images of sunshine, volcanoes, and animals from the region; even pictures of the farmers. Some of the best bags come from Costa Rica, Peru and Indonesia.” He explains that the entrepreneurial mindset of the past typically aimed for outsourcing and cutting corners to make things cheaper. The overall goal was to maximize profit. But for Chad, rather than a race to the bottom cost, he aims to create more value. His primary commitment is to continuously refine the details to offer an artistically crafted, high-quality product. Although P.U.N.A. bags are primarily focused on the art and aesthetic quality, no corners have been cut in the quality of the design and construction. Every panel is reinforced and lined with Cordura and other durable fabrics.